Objective To assess the impact of a set of interventions in reducing the interruption/distraction rate during medication administration. Design and participants Pre- and postintervention observational study of nurses undertaking medication rounds. Setting Acute Medical Admissions Unit (AMAU) of a 1000-bed teaching hospital. Intervention A set of measures previously proven successful in reducing interruptions (behaviour modification and staff education; checklists; visible symbols in the form of a red vest; and signage) were adapted and introduced onto the AMAU. Main outcome measures Rate of interruptions and distractions pre- and postintervention overall and for each individual source of interruption. Results There was a highly significant association (p<0.0001) between the overall interruption/distraction rate and the pre-/postintervention studies, with the rate of interruptions postintervention being 0.43 times that of the preintervention level. When individual sources of interruptions and distractions were compared pre- and postintervention, a significant difference (p<0.05) in the interruption/distraction rate was found for five of the 11 categories assessed. Conclusions The data support a multifactorial approach to reducing the interruption/distraction rate on medication rounds. Suggestions for future research include: directly quantifying the impact of the interventions described in this study on the volume of medication administration errors; assessing the time lost as a result of interruptions and distractions during the medication round; and developing a standardised means of recording and analysing interruptions and distractions to allow meaningful comparison of the benefits of interventions across studies. Studies have demonstrated that interruptions to the workflow of healthcare professionals are very common,1–4 and in hospitals a highly interruptive environment is generally accepted as the norm.5 ,6 However, with the exception of the area of dispensing of medications, there is as yet little evidence directly linking interruptions to medication errors and adverse patient outcomes.7 ,8 In a 2009 review of interruptions in healthcare, Grundgeiger observed that this lack of evidence is in part due to the use of research methods unsuited to detecting the association between interruptions and medication errors.7 However, in several qualitative studies, nursing staff have identified interruptions and distractions as a contributory factors to medication errors.9 ,10 In addition, there is a large volume of evidence from other high-risk industries, in particular aviation, demonstrating that interruptions increase error and accident rate.4 Interruptions and distractions are thought to impact on ‘prospective memory’ or the ability to remember to do something that must be deferred.3 ,8 Furthermore, such disruptions are known to increase workers' stress levels as a result of competing demands for attention and the resultant increase in time pressure.2 It is therefore a logical strategy to attempt to reduce the risk of medication errors by minimising unnecessary interruptions and distractions to healthcare staff. In this study, we aimed to expand the existing knowledge base in this field by assessing the value of a set of interventions in reducing interruptions and distractions experienced by nurses during medication rounds. This study was undertaken on the Acute Medical Admissions Unit (AMAU) of a 1000-bed acute teaching hospital. The AMAU is a 59-bed unit comprising 12 individual patient rooms and a number of multibed bays (seven six-bed bays plus a three-bed bay). The AMAU was selected as the site for this study for two reasons: first, a safety culture survey undertaken on this unit had highlighted a concern of the nursing staff that interruptions during the medication round increased the risk of medication administration errors;18 second, past research has indicated that interruptive communication seems to dominate in stressful hospital environments.1 The AMAU is a short-stay high-intensity unit to which patients are admitted following assessment in the emergency department. The rapid turnover of acutely ill patients creates high-pressure surroundings where nursing staff would be likely to benefit from interventions designed to improve concentration. A pre- and postintervention observational study of nurses undertaking medication rounds was conducted on the AMAU. Unlike Pape14 who compared the counts of interruptions pre- and postintervention, we calculated and compared the rate of interruptions and distractions (number of interruptions/hour). We considered the interruption/distraction rate to be a more meaningful measure than the count, as the duration of medication rounds varies greatly. A single observer (the hospital medication safety officer) shadowed nurses for a total of 16 medication rounds; four at each of the four times rounds are scheduled on the AMAU—06:00, 12:00, 18:00 and 22:00 h. The preintervention assessment was undertaken in November 2008 to January 2009, and the postintervention assessment in June 2009. Participation in the study was voluntary, and verbal consent was sought from each nurse prior to beginning each observation period. An interruption was defined as an external factor causing the cessation of productive activity before a current task is complete.8 A distraction was defined as a stimulus from an external source that results in an observable response, but not the cessation of activity.8 A modified version of a validated instrument, the Medication Administration Distraction Observation Sheet (MADOS),14 was used to collect a standardised data set, that is the number of each of 11 sources of interruption experienced during the medication round (table 1). The medication round was considered to be the time from which the nurse opened the medication trolley to begin the round until all medications were administered. The duration of each medication round was recorded, and the interruption/distraction rate calculated. A set of interventions previously proven successful in reducing interruptions and distractions (behaviour modification and staff education; checklists; visible symbols in the form of a red vest; and signage14 ,15) was adapted for our hospital setting. As an additional intervention, patient information leaflets were designed in order to foster an awareness among the inpatients on the ward of the consequences of interruption. All interventions with the exception of the education sessions were introduced on a single day at the end of May 2009. In order to prepare staff for the introduction of the initiative, multiple education sessions were scheduled during April to May 2009 for different staff groups on both day and night shifts. Although the preintervention assessment had been completed in January 2009, the commencement of the education sessions was delayed until April to allow for a new medicines management policy to be launched on which the content of the checklist was based. Unlike published practice which has used visual alerting symbols in the form of fabric vests or wipe-clean reflective sashes or tabards,19 we opted for disposable red plastic aprons for a variety of reasons. First, we felt that a system of daily home laundering of fabric vests by staff would be difficult, if not impossible, to sustain. Second, the hospital infection control team envisaged logistical difficulties with ensuring the appropriate decontamination of reusable vests or sashes. Third, the nursing staff in the hospital were already familiar with the use of white plastic aprons for infection control purposes, and so the introduction of a red version did not represent a major change to practice. if medications are missing from the trolley, retain the prescription sheets concerned, and retrieve all outstanding medications in a single trip to the supplies room when the round is complete. during each shift, designate a nurse not involved in medication administration as the ‘key-holder,’ that is the individual who will retain the drug trolley and medication cupboard keys. A checklist encompassing the practice points detailed above was distributed to staff during the education sessions to reinforce the key messages. In addition, a laminated colour copy of the checklist was affixed to the inside lid of each of the medication trolleys on the AMAU. ‘Do not disturb’ signs were designed to alert staff to the fact that the medication round was in progress, and nurses should not be interrupted. To create a temporary ‘quiet zone,’ nurses were advised to wheel the trolley into the bay, hang the sign on the door exterior and close the bay door. In addition, a selection of alert posters were designed and displayed in high-visibility locations on the ward, such as beside telephones and hand-sterilisation gel dispensers, and on clinic room doors and corridors. Information leaflets were developed to advise patients that a pilot system to optimise patient safety was under trial on the ward. The leaflets were inserted into the orientation booklets which are distributed to patients on admission to the ward. The leaflet design incorporated a photograph of a nurse wearing one of the red aprons and a request for patient engagement with the initiative by refraining from interrupting nurses during the medication administration process unless essential to do so. Descriptive statistics are presented as rates of interruptions per hour overall, for each of the scheduled medication rounds and overall, and by source of interruption and distraction. Poisson regression analysis was applied to examine the association between the interruption/distraction rate pre- and postintervention and the variables of time of day, pre-/postintervention and both (interaction). Poisson regression is appropriate for rate data, where the rate is a count of events occurring to a particular unit of observation, divided by some measure of that unit's exposure. Each explanatory variable (hour of day, pre-/postintervention and interaction of both) was examined in predicting rates of interruptions. The counts themselves have been used as the dependent variables, and ‘exposure’ (log of duration) was used as an offset. A significant explanatory (or predictor) variable is one that significantly predicts the outcome (rate). The rate ratio is presented with 95% CIs. All analyses were performed in SAS (v 9.1; SAS Institute, Cary, North Carolina), and statistical significance at p<0.05 was assumed. The total observation time for the pre- and postintervention assessments was 30 h and 34 min (16 h, 6 min observation time preintervention and 14 h, 28 min observation time postintervention). A total of 31 nurses were observed during the pre- and postintervention studies; 23 nurses preintervention and 14 nurses postintervention, that is there was an overlap of six nurses between the pre- and postintervention group. With the exception of one male staff nurse and one female clinical nurse manager, all staff observed were female staff nurses. Staff had levels of nursing experience varying between less than 6 months and more than 20 years. Postintervention, the interruption/distraction rate was found to have decreased significantly overall and for each of the scheduled medication round times, with the exception of the 22:00 h round (p<0.05) (table 2). When a Poisson regression analysis was applied to each of the explanatory variables, time of day, pre-/postintervention and the interaction of both, only the variable of pre-/postintervention was found to significantly predict the interruption/distraction rate. The result is presented as a rate ratio comparing the interruption/distraction rate postintervention to the reference category of the rate preintervention (table 3). Thus, there was a highly significant association (p<0.0001) between the interruption/distraction rate and the pre-/postintervention studies, with the rate postintervention being 0.43 times that of the preintervention level. Comparison of the sources of interruptions and distractions pre- and postintervention revealed a significant difference (p<0.05, 95% CIs) in the interruption/distraction rate for five of the 11 categories (figure 1). Interruption/distraction rate (95% CIs) for each source of interruption and distraction pre- and postintervention. Substantial behavioural changes in relation to staff, visitors and patients were observed postintervention relative to preintervention (table 4). In line with other published research assessing disruption to medication rounds,11 ,13–15 we found that nurses administering medications experience high volumes of interruptions and distractions from a variety of sources. Quantitative comparison between studies was complicated by a lack of standardisation in data recording and analysis. In our study, for example, we chose to assess the number of interruptions and distractions per unit of time, but a variety of alternative measurements have been used in other studies of interruptions on medication rounds.11 ,13 ,14 ,20 The general impact of the interventions was the creation of a far less chaotic environment during the medication round and the development of a more controlled system of medication administration. We found that one of the greatest sources of disruption of medication rounds was nurses themselves, a finding which has been replicated in previous studies.13 ,14 Interruptions were self-induced when the nurse administering medications initiated conversation or arose from disruption of the round by their nursing colleagues. However, the categories of ‘conversation’ and ‘staff nurse’ were also among those sources of interruption and distraction significantly affected by the suite of interventions. The majority of interruptions by nursing colleagues related to searches for the drug keys, a finding also noted in previous research.13 ,21 The ‘key-holder’ system implemented in this study virtually eliminated all such disruptions. Another of the behaviour modifications postintervention—having just one nurse undertake the round rather than two—had a number of beneficial effects. First, the opportunity for nurses to interrupt each other at the trolley was eliminated. Second, the fact that only a single individual was preoccupied with administering medications meant additional nurses were available to address the queries of paramedical staff, lessening the need to disrupt the round. Although not statistically significant, a reduction in the interruption/distraction rate related to personnel and visitors was found postintervention. Behaviour changes in one group as a result of the interventions are likely to have reinforced that of other groups. For example, the alert posters displayed on the ward may have dissuaded visitors from disrupting the round, but this effect was probably amplified by the atmosphere of calm created by hospital personnel diverting interruptions from the nurse administering medications. Of all sources of interruption and distraction, the category of ‘other patients’ was the least amenable to control. Attempts to modify patient behaviour were undermined by a rapid patient turnover, and it is likely that a greater impact on this source of interruption would be achievable in a ward with a longer-stay patient cohort. Studies have shown considerable variation in the contribution doctors make to interruptions and distractions during medication administration. 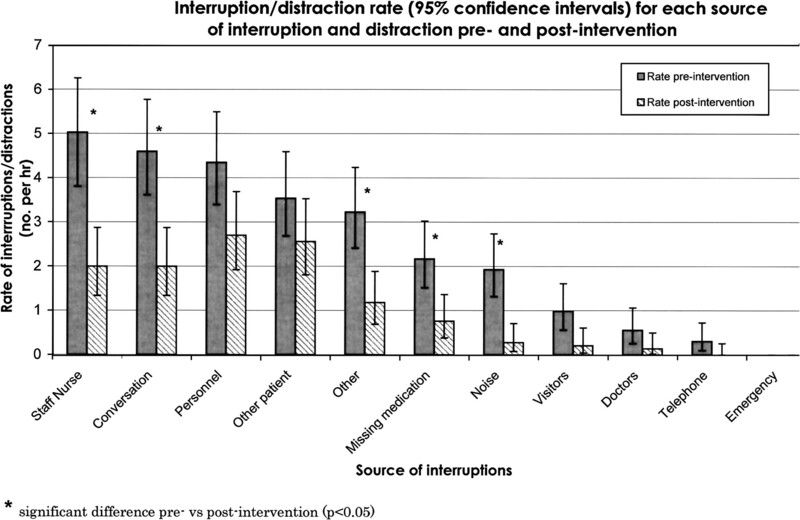 Some authors have found that doctors contribute substantially to the overall number of interruptions and distractions13 ,15 while others have found doctors to be a minor source of disruption to the medication round.12 In our study, the baseline interruption/distraction rate of doctors preintervention was very low, and consequently it is not surprising that the interventions did not impact significantly on the rate. Unlike other categories, interruption by doctors in some instances may be necessary and desirable. Where the medical team makes a significant alteration in a patient's therapy, it is important that this be communicated to the staff nurse directly responsible for the care of that patient. This may entail interrupting the nurse administering medications on occasion, but this is arguably a safer course of action than either not communicating the information or relying on the message being passed on by a third party after the round is complete. Postintervention, the behaviour changes of all groups—nurses, visitors, personnel, patients and visitors—had the additional effect of reducing noise levels, which in turn resulted in fewer distractions and interruptions during medication administration. This effect was amplified by the simple measure of closing the bay door which blocked much of the noise from the general ward environment and created a peaceful atmosphere in the vicinity of the medication round. As a result of strategies to minimise the impact of missing medications, the nurse undertaking the round was required to take far fewer trips to the supplies room, an activity which has previously been highlighted as increasing the risk of interruption.11 Reduced travel by the nurse administering medications resulted in fewer interruption opportunities for visitors or staff in the corridor. Where an interruption did occur postintervention, the impact was greatly minimised when the nurse did not engage with the query and instead referred it to a colleague or advised that the issue would be attended to once administration of the medications was complete. We are aware of several limitations to our study. The nature of the study design that is ‘before and after’ without the use of a parallel control group predisposes the results to bias. The preintervention study was undertaken in the wintertime and the postintervention study in the summertime. The time of year may have impacted on the turnover of patients on the ward which in turn would be likely to impact on the level of familiarity patients had with the ‘Do Not Disturb’ programme and therefore on the resultant rate of interruptions. The decrease in the rate of interruption postintervention relative to preintervention cannot be attributed with absolute certainty to the interventions introduced because of the possible impact of differences in patient case mix and staff demographics between the before and after studies. Details of the case mix of patients and how this varied from round to round were not considered. Patient case mix may influence the number and nature of interruptions in a variety of ways. The illnesses affecting patients might have an impact on the number of interruptions—for example age-related dementia among older patients may affect a patient's ability to comprehend the nature of the study under way. In addition, there was only a small degree of overlap between the group of nurses observed before and after the intervention. Although demographic details of all staff were recorded, the impact of factors such as age and level of experience on the results of the study was not considered. It is unknown to what extent the observer influenced the behaviour of staff during the assessment. Efforts were made to limit the Hawthorne effect by the observer maintaining a distance of several feet from the nurse administering medications, adopting a discreet observation behaviour and not engaging in conversation with staff. These efforts meant that on a couple of occasions, the observer was out of earshot of the nurse undertaking the round, so it was not possible to monitor if an observed conversation was case-relevant. Conversation also could not be monitored when nurses had entered the individual patient side rooms. An additional limitation related to the fact that, owing to the significant time commitment required to undertake the observational study, only one rater was involved in recording and coding interruptions and distractions. As a result, it was not possible to check the reliability of the counting and coding of disruptions by crosschecking with a second observer. Finally, generalisability of the study is limited, as the system of care, ward layout and staffing patterns may be unique to this hospital, and cultural factors might affect the impact of the interventions in other countries/settings. This study demonstrated that nursing staff in an AMAU environment experience high levels of interruptions from multiple sources while administering medications. A multifaceted intervention programme was successful in significantly reducing the overall interruption rate during medication rounds. The authors believe that the measures introduced to address interruptions interacted and reinforced each other, making it difficult to assess the impact of any single intervention in isolation. Following the success of the initiative in reducing interruptions and distractions, the programme has been adopted by the Nurse Practice Development Unit for introduction across the hospital on a phased basis. Suggestions for future research include: directly quantifying the impact of the interventions described in this study on the volume of medication administration errors; assessing the time lost as a result of interruptions and distractions during the medication round; and developing a standardised means of recording and analysing interruptions and distractions to allow meaningful comparison of the benefits of interventions across studies. The authors wish to acknowledge the contribution of the AMAU staff to this project. Our thanks to K Bennett for her support with statistics.
. Interruptive communication patterns in the intensive care unit ward round. Int J Med Inform 2005;74:791–6.
. Emergency department workplace interruptions: are emergency physicians ‘interrupt-driven’ and ‘multitasking’? Acad Emerg Med 2000;7:1239–43.
. Communication loads on clinical staff in the emergency department. MJA 2002;176:415–18.
. Measuring intra-operative interference from distraction and interruption observed in the operating theatre. Ergonomics 2006;49:589–604.
. Distractions, interruptions and patient safety. AORN J 2007;86:109–12.
. Distractions and interruptions: development of a healthcare sterile cockpit. Newborn Infant Nurs Rev 2008;8:108–10.
. Interruptions in healthcare: theoretical views. Int J Med Inform 2009;78:293–307.
. The effect of health care working conditions on patient safety. Rockville, MD: Agency for Healthcare Research and Quality, 2003. http://www.ahrq.gov/downloads/pub/evidence/pdf/work/work.pdf (accessed 30 Nov 2009).
. Adverse events in drug administration: a literature review. J Nurs Manage 2003;11:130–40.
. Factors contributing to incidents in medicine administration. Part 2. Br J Nurs 2007;16:678–81.
. Interruptions during nurses' drug rounds in surgical wards: observational study. J Nurs Manage 2009;17:185–92.
. Medication administration times study (MATS): nursing staff performance of medication administration. J Nurs Adm 2009;39:204–10.
. Interruptions during drug rounds: an observational study. Br J Nurs 2008;17:1326–30.
. Applying airline safety practices to medication administration. Med Surg Nurs 2003;12:77–93.
. Innovative approaches to reducing nurses' distractions during medication administration. J Contin Educ Nurs 2005;36:108–16. Releasing time to care. Productive ward. NHS Report. April 2007. Keeping patients safe: transforming the work environment of nurses. Washington: Institute of Medicine of the National Academies, 2004. http://www.iom.edu/en.aspx (accessed 30 Nov 2009).
. Measuring safety culture; application of the safety attitudes questionnaire to an acute medical admissions unit. Ir J Med Sci 2009;178:433–9.
. Checklists with medication vest or sash reduce distractions during medication administration. AHRQ innovations exchange. http://www.innovations.ahrq.gov/content.aspx?id=1799 (accessed 30 Nov 2009).
. Understanding the cognitive work of nurses in the acute care environment. JONA 2005;35:327–35.
. Operational failures and interruptions in hospital nursing. Health Serv Res 2006;41:643–62. Competing interests The authors have no conflicts of interest other than that they are reporting outcomes from the organisation by which they are also employed.